Aquariums are found in millions of homes, all over the world. As a peaceful and fascinating way of bringing sea life into your home, its been a popular pastime for decades. And now, aquariums are more popular than ever. With lighter tanks and more varieties of fish and tank decorations, you have the freedom to create the fish tank you’ve always wanted. 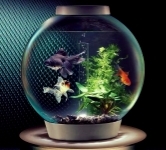 Some of the Easiest way of maintaining Aquarium is given here for the beginners. Freshwater aquarium fish are fed a proper diet and amount of food. It is important to note that you have to feed fish in proper amount. It’s not good to underfeed fish. Fish that go hungry may become aggressive toward one another. And also do not overfeed which makes your fish healthy. 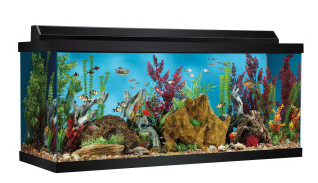 Aquarium Fish Tank Sizes may vary with brand and type or color. Dimension of One brand fish tank vary with the brand of other tank. This will though not effect much, but if you are more concern about space of your home then its better to figure it out before. So ask the storekeeper to measure with tape infront of your eyes and not believe what is printed on the box. Usually for measuring tank the common term we use is gallons. Here i have mention some of the standard sizes. 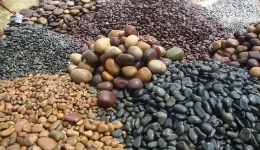 Stones comes under huge variety also depends upon size, color, shape etc. Instead of selecting based on color i suggest you to chose something that looks like real aquatic life. So go for some Dead rocks with few small stones of odour colur and very less color stones if you want such as shown above . Aquatic Plants Add beauty to the as it extract the perfect combination with fish. Its not like that you can take any plant for your aquarium. Aquarium plants with fine or delicate leaves are less hardy and may not be easy for beginners to keep. Anubias Barteri, Anacharis, Water Sprite, Cabomba Plant, White Sanderiana, Brazilian Pennywort are such variety of plants for the beginners. Aquarium filters provide filtration in mainly three areas: mechanical filtration, biological filtration and chemical filtration. You have to be careful about filters because it is required to filter your water at proper interval. O rings are also used inplace where filter leaks. Plumbing etc are some of the other decorative item one can use in order to decorate. Its totally depend upon you how much you want to do. An average aquarium say about 150 gallons costs around $400 to $1000. What fish species do I want to keep? Is the aquarium size appropriate for the fish? Where should the aquarium be placed in the room? In hall or say Dining room so that it makes beauty for your guests eyes. What will the aquarium be placed on? Powerstand are coming along with aquarium you can also use table. What lighting system should be chosen? Lighting System should be light blue or green which looks like sea.